We are a small family business comprising of Royston, Nigel & Sylvia. Ormatronix started in July 2004, prior to this Royston had 30 years repairing organs for Wyvern Organs Ltd & Renatus Ltd. We specialize in the repair of organs using the Bradford Computer System, developed by Bradford University & Wyvern Organs. 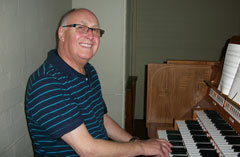 Watch the video of me adding supplementary amplifiers and loudspeakers to the organ at Send Parish Church in Surrey. The work was done by Ormatronix Organs of Wolverhampton. Organ in St. Luke’s Church, Kingstanding designed & installed by me. Repairing the organ in St. Catherine's Church, Towersey. 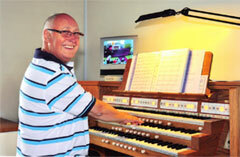 Organ recently repaired in Bacons College, Rotherhithe. 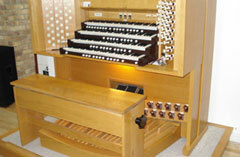 Organ of St. Francis of Assisi, Wednesbury where I am Director of Music & the Organ is also designed & installed by me.